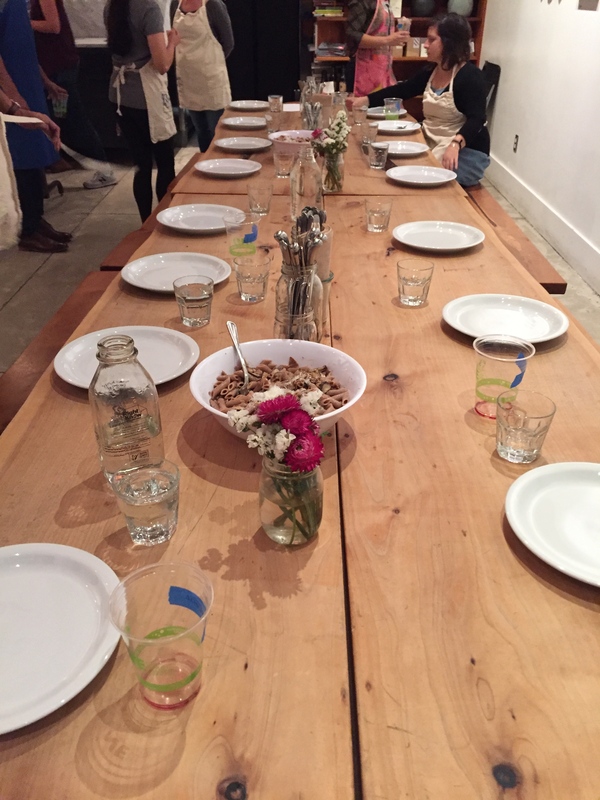 I took a hands-on cooking class at 18 Reasons last month. It is located in the Mission right next to Delores Park. They offer a variety of classes ranging from French bistro basics to Arabic bread-making . They also offer cooking classes in low-income communities. 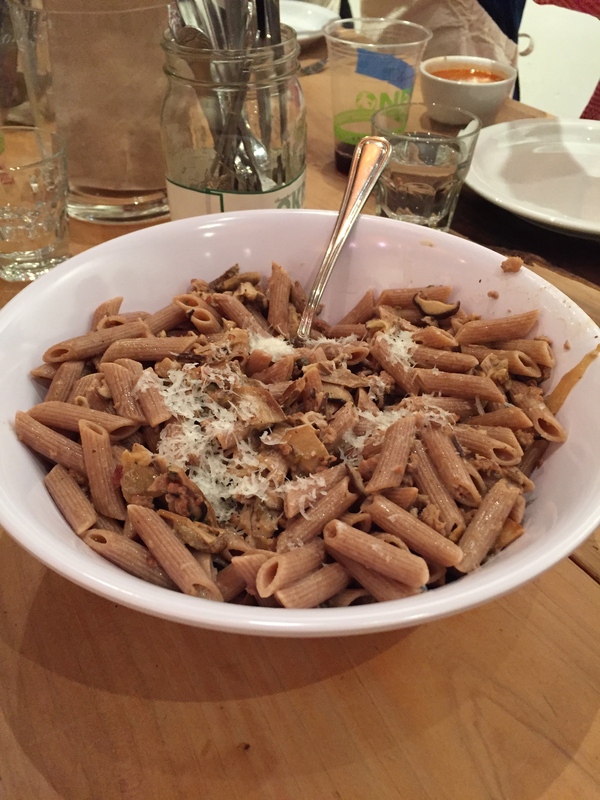 I attended the Italian cooking class with an emphasis on chestnuts and mushrooms. The focus ingredients change seasonally. Our instructor led us back to the industrial kitchen and divided us into groups of 3-5 per dish. Then she set us loose with the recipes, giving assistance only when needed. She came around and served us wine while we cooked. When the food was ready we ate together at a large table in the front room. My favorite was the penne and the chestnut mousse dessert. Soak the porcini in warm water. Remove the sausage from its casing and crumble it. Halve the yellow onion and slice it paper thin. Remove the stems from the mushrooms and slice the caps. Heat the olive oil in a sauté pan. Add the onion with a generous pinch of salt. Gently soften over medium-low heat until it picks up a light golden color, stirring often to prevent it from sticking to the bottom of the pan. Raise the heat to high and add the crumbled sausage. Sauté for 3 to 4 minutes, until it renders some fat and begins to cook. Strain and squeeze the porcini and chop roughly. Add the shiitake and porcini to the sausage. The mushrooms will wilt and release moisture. Continue cooking over lively heat for about 10 minutes, stirring often. Drop the pasta in a salted pot of boiling water and cook al dente. While the pasta is cooking, check that the moisture has evaporated from the sauce, then add the cream. Bring the sauce to a boil and lower the flame. The sauce will bubble slightly and in 5 to 10 minutes the cream will thicken slightly. Adjust salt and pepper. Remove the pasta from the water with a handheld strainer and transfer it into the sauce. Raise the heat to max and add a small ladleful of pasta cooking water. Stir and toss over the heat for 2 to 3 minutes to make sure all the ingredients are nicely amalgamated. If the sauce looks too dry add a bit more cooking water before transferring to a warm serving platter. Serve immediately with the grated pecorino on the side. Whip the yolks and sugar until they are pale and fluffy and the sugar is completely dissolved. Place the chestnut cream in a food processor and add the corn syrup and vanilla extract. Pulse until smooth and soft. Taste for sweetness, if you would like it a little sweeter, then add some sugar. Work the sweetened chestnut cream into the yolk and sugar until it is an even colored mixture. Whip the cream to medium peaks and fold into the rest of the ingredients, being mindful not to deflate it. Spoon into individual ramekins. Place in the freezer to set for about 20 minutes. In the meantime, chop the chocolate in small chips. Serve sprinkled with hand chipped chocolate. NOTE: if you find the sweetened chestnut cream, you can use that and scratch the corn syrup and vanilla. Also: I love serving this with cookies or little meringues. If you’re interested, I’m happy to send you the rest of the recipes!